← Are you sabotaging your sleep? Did you know that humans only started to consume dairy around 9, 000 years ago, when they started domesticating goats, sheep and cows? For more than 2 million years, humans thrived just fine without dairy. In fact, back then we were taller, stronger and leaner and didn’t suffer from osteoporosis. I mean isn’t the milk in a cow’s udders meant to nourish her baby and not us? In this post I will offer a delicious alternative to cow’s milk and how to go about making it yourself. This alternative leaves soya, rice and oat milk in it’s dust! This article is not about “dairy bashing”. I am just sharing with you that for many people (myself included), the consumption of dairy can be a huge barrier to weight loss. For some reason, dairy causes a significant insulin response which tells your body to store fat. Milk is also pretty high in carbs (around 11 grams in 250 ml). So that grande latte from Woolies when doing your shopping is not doing your waist line any good. If you have been following a “low carb” diet and just can’t understand why you are not losing weight, then try cutting the milk for a few weeks and see if that helps. I am not keen to argue the pros and cons of consuming milk. It is a very complex issue and is definitely a controversial topic in the paleo/primal community. At the end of the day it is the personal results that matter. I am just giving you something to consider. I never drank glasses of milk but I was having up to 6 cups of tea and coffee a day (always with milk added). That adds up. But it never occurred to me that milk was a problem until my nutritionist informed me otherwise. What is a good milk alternative? In my humble opinion, soya milk tastes gross, rice milk is watery and oat milk is made from grains (and we DON’T DO grains as you know). A delicious alternative is almond milk. Now if you go and buy it from a health shop, it will seriously empty out your wallet and it might be sweetened with sugar. Fortunately, it is very easy to make almond milk yourself at home for a fraction of the cost. So how does one milk an almond? Put all ingredients into your blender. Blend on high for about 2 minutes. Pour mixture into the nut milk bag over a jug or bowl and strain. Keep your fresh, creamy almond milk in the fridge for up to 5 days. Use your almond milk in your coffee, as a base for smoothies or enjoy on its own. Add some unsweetened cocoa powder for a yummy chocolate drink or blend with some fresh strawberries. I am sure it would also be divine with Chai flavoured tea. 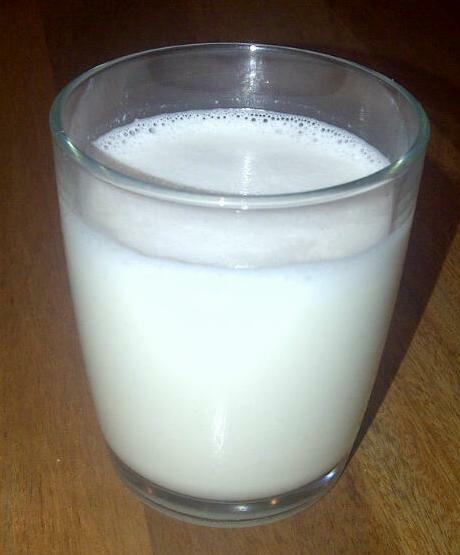 Have a small glass of almond milk with 2 teaspoons of psyllium husks mixed in to up your fibre each day. Let the husks soak in the almond milk for a few minutes and then drink it. It becomes thick and filling. The bonus is that almond milk only has about 1 – 2 grams of carbs per cup (provided you don’t sweeten it too much). Almond milk is also a good source of vitamins and minerals. The almond pulp left over after straining can be used for baking. Here is a great 5 minute video clip on exactly how to make it. Posted on September 20, 2013, in Primal 101 and tagged almond milk, dairy alternatives, low carb almond milk. Bookmark the permalink. 2 Comments. We must really try your almond milk when next we visit.